November has been a big month for Resource Conservation District of Monterey County (RCDMC) with an exciting amount of public recognition coming our way. 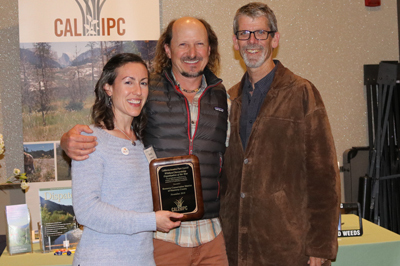 On November 8th, RCDMC was recognized as ‘Wildland Stewardship Organization of the Year’ at California Invasive Plant Council (Cal-IPC) 2018 Symposium awards ceremony in Monterey. Moreover, we were also recently featured on KION in the News Feature “Special Report: Non-native plant invading Salinas River” on November 22nd of this year. RCDMC is being noted for our Salinas River Arundo Control Program work, which has to-date treated approximately 500 out of 1500 total acres of the invasive plant Arundo donax along the Salinas River. Arundo is a highly invasive weed in Monterey County that crowds out native vegetation, degrades wildlife habitat, consumes large amounts of water, and increases the risk of flooding to adjacent farm fields and cities. Our Salinas River Arundo Control Program has been treating the highly invasive weed on a large scale, with herbicide application and mechanical removal with mowers along much of the 90-mile-long stretch of the Salinas River in Monterey County. More work is planned for the coming years to treat the remaining 1000 acres, in an effort to completely rid the Salinas River of the noxious weed by 2030. The welcomed media attention has been directed towards Emily Zefferman, RCDMC Ecologist and Arundo Control Program Manager, and Paul Robins, RCDMC Executive Director, who are more than happy to answer any questions the public may have. Check out the KION news feature.